Anthurium, is a large genus of about 600-800 (possibly 1,000) species of flowering plants, belonging to the arum family (Araceae). 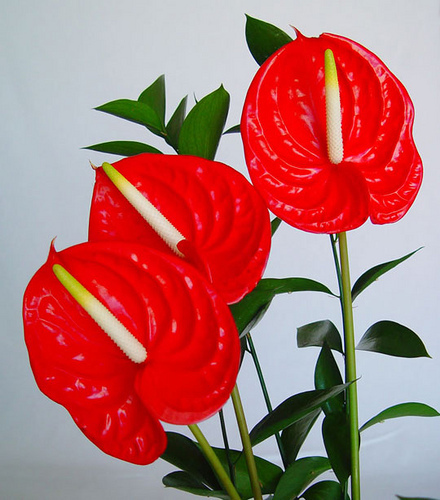 Anthurium can also be called "flamingo flower" or "boy flower", both referring to the structure of the spathe and spadix.The Anthurium was discovered in 1876 in Colombia. Anthurium grows in many forms, mostly evergreen, bushy or climbing epiphytes with roots that can hang from the canopy all the way to the floor of the rain forest. There are also many terrestrial forms which are found as understory plants, as well as hemiepiphytic forms. They occur also as lithophytes. Some are only found in association with arboreal ant colonies or growing on rocks in midstream (such as Anthurium amnicola). 2.8% of the country's GDP is derived from agriculture. Of a total labor force of 2.7 million, 2.6% are employed in agricultural production while 6.3% in services for agriculture. While Israel imports substantial quantities of grain (approximately 80% of local consumption), it is largely self-sufficient in other agricultural products and food stuffs. For centuries, farmers of the region have grown varieties of citrus fruits, such as grapefruit, oranges and lemons. 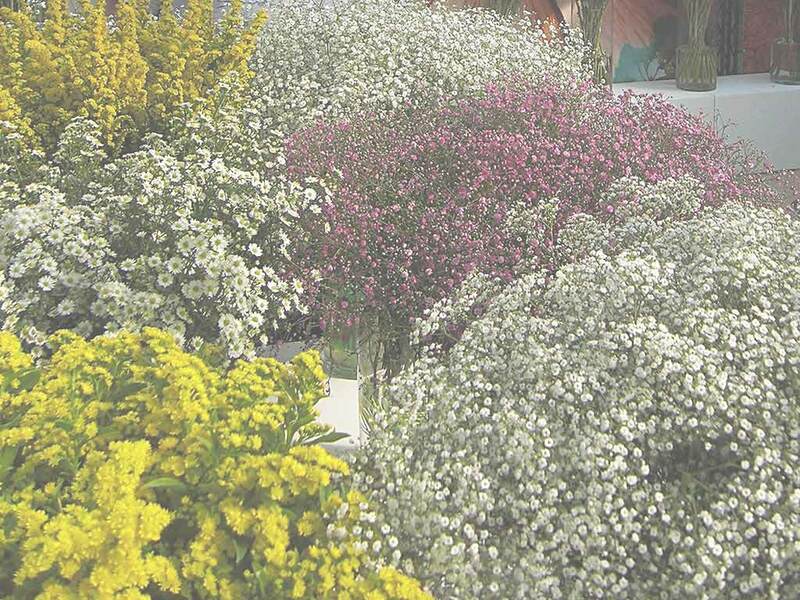 Farm fresh grower-direct flowers from following varieties: astilbe, rose spray, paeonia, moluccella, roses, eremurus, eustoma, limonium, kangaroo paw, aster, gypsophila, iris, ranunculus, gomphrena, cotton, trachelium, prothea, hippeastrum, gerbera, gypso, strelitzia, green bell, tulip, leucospermum, agapanthus, delphinium, craspedia, ozothamnus, grevillea, campanula, phlox, ixia, achillea, statice, freesia, asclepias, curcuma, gerbera mini, roses tea, gladiolus, kniphofia, lilium, veronica, solidago, desert yearning, wax flower, liatris, ornithogalum, antirrhinum, anemone, globularia, chrysanthemum, calla, anigozanthos, bouvardia, crocosmia, banksia, capsicum, carthamus, godetia, roses small head, echinops, dianthus, matricaria, gerbera standard, tanacetum, sunflower, narcissus, aconitum, celosia, matthiola, alstroemeria, lisianthus, etc. Fresh cut foliage of the following varieties: myrtus, viburnum, cyperus, artichoke, rotem, salix, myrsine, hibiscus, ruscus, palm, prunus, agonis, steel grass, aralia, hedera, aspidistra, eucalyptus, rhamnus, philodendron, kochia, euonymus, adenanthos, murraya, asparagus, croton, photinia, hypericum, melaleuca, acacia, myrica, euphorbia, fern, pittosporum, cotton, cocculus, chondropetalum, cyrtomium, bear grass, cycas, monstera, grevillea, leucadendron, etc. Fresh herbs and lettuce salads from leading Israeli growers: rucola, rosemary, lemon balm, chives, rucola baby, basil, marjoram sweet, parsley flat, romaine lettuce, marjoram, spinach, dill, tarragon, mint, thyme, mizuna, salicornia, arugula deluxe, chervil, lollo rosso lettuce, rucola deluxe, basil green, bulls blood, arugula, basil red, red chard, baby mix salad, lemon grass, sage, peppermint, oregano, savory, coriander, lemongrass, arugula baby, sorrel, parsley curly, baby spring mix lettuce, tatsoi, etc. Used as spices and seasoning herbs herb in recipes of healthy food cooking. All year long best price fresh herb and salad wholesaler supplies. Our produce can be delivered worldwide by air cargo carriers to the following international destinations: Latvia, Turkey, Malta, Panama, Poland, Norway, Ukraine, Nicaragua, Ecuador, Bosnia, Austria, Belarus, Slovenia, Colombia, Australia, Holland, Liechtenstein, Republic of Ireland, Belgium, Macedonia, Japan, Lithuania, Kyrgyzstan, Iceland, United States, India, France, Uzbekistan, Paraguay, Belarus, Singapore, Spain, Venezuela, Slovakia, Kazakhstan, Peru, Azerbaijan, Kazakhstan, Ukraine, Argentina, Germany, Cyprus, Monaco, Greece, Switzerland, Bulgaria, Taiwan, Turkmenistan, Gibraltar, Mexico, South Africa, Costa Rica, UK, Uruguay, Sri Lanka, New Zealand, Andorra, Malaysia, Hungary, Netherlands, Laos, Georgia, Estonia, Thailand, Denmark, Armenia, China, Sweden, Canada, Russia, Philippines, United Kingdom, Brazil, Bolivia, Croatia, South Korea, CIS countries, Luxembourg, Moldova, Czech Republic, Romania, Italy, Vietnam, Hong Kong, Tajikistan, Portugal, Indonesia, Finland, Chile, USA, etc.